With digital artwork and photo editing moving more into a consumer market, Wacom, the industry standard manufacturers of graphics tablets and interactive pen displays, have created the perfect entry level product aimed at those who are just starting to explore their digital creative side. Designed to be portable and stylish, the Wacom Bamboo Fun is perfect for people who want to use a graphics tablet but have no need for anything expensive or too technologically advanced. Available in 4 colors, (white, silver, black and blue) the Wacom Bamboo Fun will appeal to all ages and skill levels and is perfect for doodling, annotating documents in your own handwriting or creating a new masterpiece in Adobe Photoshop. The Bamboo Fun fits perfectly into your workspace due to it’s slim and meagre size and design. 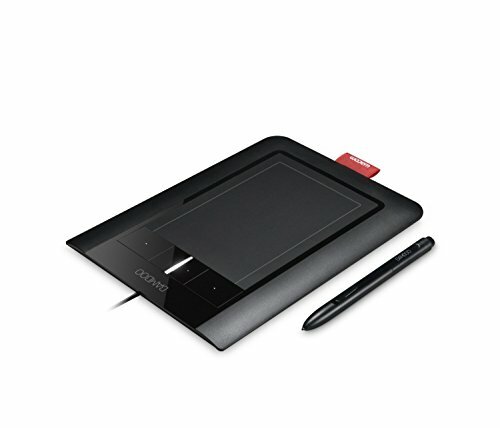 With an active area the same as an A6 piece of paper, it is perfect for drawing, digital painting, touching up digital images or creating layouts in a graphics design application. Due to it’s small size and low weight and with 4 programable action keys, the Bamboo Fun is perfect for slipping into a laptop bag to take on holiday, to work or to school. Powered by a USB connection to your PC or Mac, the Bamboo Fun is perfect to use anywhere and at any time. Imagine being able to take your own notes in a lesson or sketch ideas at a meeting. It is all possible with a Wacom Bamboo Fun graphics tablet. If you are more of a professional, the Wacom Bamboo Fun Medium offers a greater active area for you to use, or the range of Wacom Intuos graphics tablets are the next step up in size and functionality.